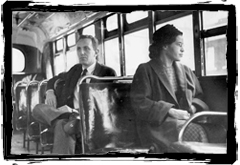 Rosa Parks is an American Hero. A woman who quietly, peacefully, guided public consciousness towards racial equality. To me she is a courageous and inspirational role model. A woman who refused to be marginalized or acquiesce to demeaning treatment We as a society have come a long way in 50 years, but we have a long way to go. Like Rosa Parks, the champions of our future will be Women.